In her short life, Elizabeth manifested such great love for the poor and suffering that she has become the patroness of Catholic charities and of the Secular Franciscan Order. The daughter of the King of Hungary, Elizabeth chose a life of penance and asceticism when a life of leisure and luxury could easily have been hers. 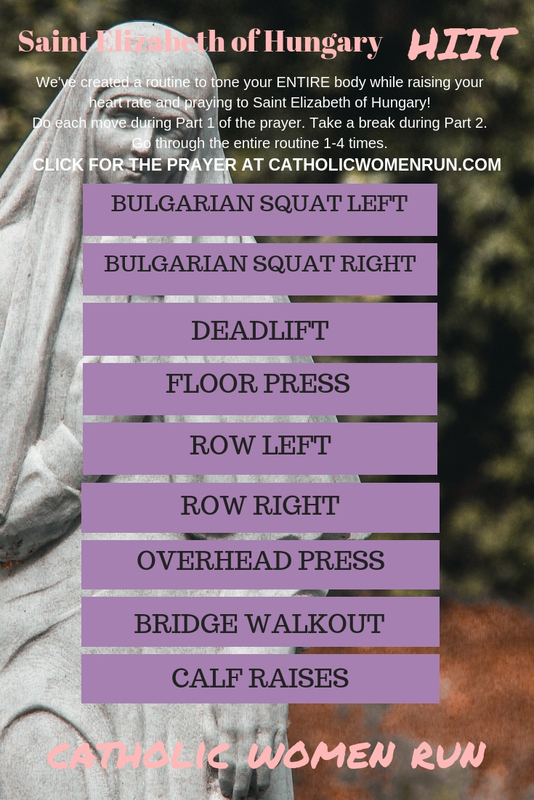 Let us take inspiration from this saint, whose feast day is on Saturday, as we strengthen our bodies today! Then go through your nine moves while praying the following: O blessed Elizabeth, in your life here on earth you knew how to balance austerity and sweetness, and you saw denying oneself in its proper light. Help me to follow your example and to contemplate the law of dying to self which appears so austere; and yet is of delicious sweetness, when one sees the end of this dying, which if the life of God put in place of our life of sin and misery. Pray for me that, through your example, my whole exercise may be to abide in Love. Teach me how to abide, in love and faith, with the Holy Trinity in the depth of my heart. Teach me how to radiate God’s love among men and women, in my everyday life, just as you did yourself, so that I may be a praise of God’s glory. Between each move, give yourself a rest period by praying this: Almighty, everlasting God, I pray that through the intercession of Saint Blessed Elizabeth of the Trinity you will bestow upon me the fullness of your mercy for which I long, and that I may abide in the Love of Christ. I ask this prayer through our Lord Jesus Christ. Amen.